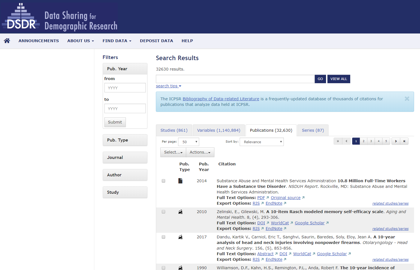 We are a data sharing project for the demography and population sciences community. As part of our mission, we serve all population centers, but in particular, we provide data curation and archiving services for the centers for population studies. Run basic crosstabs, frequencies, and more complex analyses for many DSDR studies without downloading data! From a study homepage, select the "Analyze Online" button to explore this feature. Visit the DSDR page on SDA to learn more!